Mix shortening, sugar, and molasses thoroughly. Stir in water. Measure flour by sifting. Blend all dry ingredients; stir in. Chill. Heat oven to 350°. Roll dough 1/4 inch thick on lightly floured board. 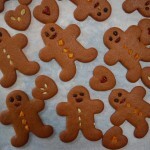 Cut with gingerbread figure cutter or other favorite shaped cutter. Place far apart on lightly greased baking sheet. Bake 10 to 12 minutes or until no imprint remains when touched lightly. Ice the cooled cookies. Note: If you use Gold Medal Self-Rising Flour, omit soda & salt. Blend 1 1/2 cups sifted confectioners’ sugar, 1/4 tsp. vanilla, and enough cream (2 to 3 tbsp.) to make a thin icing. Makes icing for 15×10 inch pan of cookies.